What is “50 Dragons” mobile slot about? 50 Dragons is a slot game by Aristocrat. 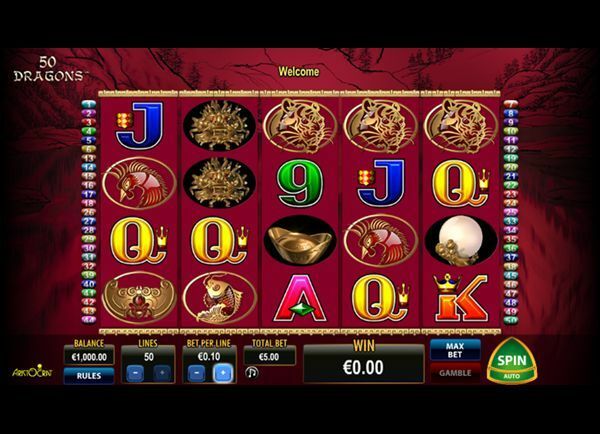 The HTML5 game is playable through various different online gambling portals. With the correct version of Flash, the game is playable on smartphones (iPhones, Android devices, etc. ), tablets and desktop. No download is needed as the game works within the browser. In 50 Dragons, the player can chose between 1 and 50 lines to bet an amount of €0.02 to €4 per line. The total bet therefore ranges from €0.02 to €200. On the side of the game the player can see which lines are activated. Every time the player wins, the amount won per line is shown at the top of the game. The game has been created with an oriental setting in mind. The background depicts an ancient Eastern looking drawing and the symbols of the game also have this oriental feeling, depicting tigers and roosters as example. There are sound effects but no songs that are played while spinning or as background. The colourful scheme makes the game send out a warm feeling towards the player. With a maximum of €200 to bet, the player can gamble huge in this game. The highest possible win in a single line would be 200 x 1,000 which is €200,000. This is without the gamble feature which can double or quadruple your earnings each gamble until you stop, but also lose it all. The symbols all have a different value, but some can be the same. The game’s lowest symbols are 9 and 10. Just like a in a deck of cards the value won increases when the cards change towards ace and king. A 10 or 9 can award the player the same amount as a queen or jack, except when 4 of a kind appear the amount won is different. Getting 5 of a dragon symbol is arguably the best possible line to get, becoming a 1,000x multiplier. There is no jackpot feature in the game, but a few different special winnings are included. The game features a pearl symbol and an ingot symbol. The pearl symbol functions as a wild symbol, becoming a substitute for all symbols except the ingot symbol. The ingot symbol counts as a possible 10 free game bonus, when an ingot appears in reel 1, 2, and 3. In these free games the player can once get three ingots in the first three reels again, giving an extra 5 free bonus games. In every free game an extra wild pearl is added to reels 2 to 5 for the remaining games. A slot with filigree character.